Cut the coffee, tea and alcohol. In fact, how about a week? 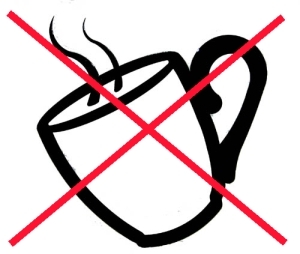 Okay, if you are a coffee addict then you might suffer from mild headaches after the first day or two, but keep going and you’ll find that you are not so tired any more and you’ll be more ready to exercise and get yourself fit and lean. Tea is equally bad for most people’s systems and dropping it altogether is tough. If you still need a hot drink, then buy some peppermint or other teas. Alternatively, just get some fresh lemons and cut a slice and pour on hot water. It is both refreshing and great for cleaning out the system. Lastly, the alcohol habit might be easier or harder to quit. If you are a heavy drinker and find it hard to quit straight away, then you might want to reduce your alcohol before stopping entirely. Equally, other people can just stop. Either way, giving up a strong drinking habit will benefit from the support of your family, friends and possibly your doctor. Regardless of how much letting go you need to do, increase your intake of water. This will help ‘quench’ the desire and ensure that you are well hydrated. A good water intake will also help you detox and, if you are prone to headaches whilst switching, reduce those headaches too. Equally, do some research on the long term effects of alcohol and you’ll find that an alcohol free diet (okay, bar the occasional glass of red wine) will help you live longer and live healthier. Why not take out 7 day – free – online detox course?